Have you ever encountered doors you don’t know whether to push or pull and ending up doing the wrong action? I’m fairly sure that many of us have, and in such occurrences, we normally blame ourselves, or somebody else, for the blunder. But is it really our fault… or is it the door’s fault? It may sound absurd for some to blame the door. But with the countless bloopers committed by many, it’s safe to say that bad doors, or the so-called Norman doors, are everywhere. So yes, we can free ourselves from guilt because that annoying door is the one at fault. However, it’s not fair to single out doors in particular as bad designs are ubiquitous. Now as someone who occasionally got victimized by Norman doors, I sought for an explanation, as well as validation, that it was not my fault for making such a recurring mistake. So when I found the last copy on display of The Design of Everyday Things by Don Norman at the 2016 Manila International Book Fair, I picked it up and went straight to the counter. 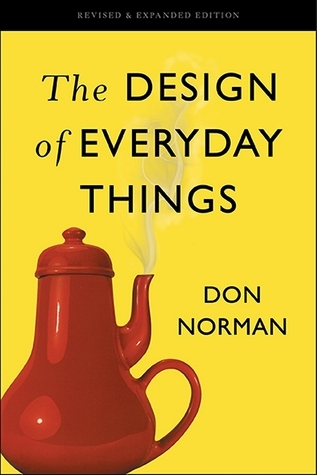 First published as The Psychology of Everyday Things in 1988, The Design of Everyday Things was written by Don Norman (whom the Norman door is named after), a cognitive scientist and usability engineer. In the book, he talks about the subjects of behavioral psychology, ergonomics, design thinking and practice. But don’t get intimidated by those scholarly terms as reading the book is not as hard as reading a quantum mechanics textbook. It doesn’t involve rocket science either, as Don Norman only reintroduces us to everyday things we thought we already knew about. More interestingly, the book explores our thought process and how it manifests in our actions. After reading the book, I found myself having the last book syndrome. I kept on scrutinizing every thing I saw in an attempt to bust the bad designs around. From my personal things like cellphone, laptop and clothing to our home fixtures, appliances and their arrangement, and even the house itself, I checked—and not surprisingly, bad designs were indeed all over the place. In case you’re taking this the other way, don’t think this book ever only teaches us to complain about everything wrong. The real objective is to point out what can be innovated in order to make our lives much easier through good design. Furthermore, it seeks to elucidate the often taken-for-granted relationship between human beings and objects. The goal of the book is to make us understand and effectively apply the principles of design. Aside from the Norman door, some of us, at some point in time, may have already found ourselves getting confused on how to use the tap. Using the tap should be a no-brainer, right? But when in a new environment such as in a hotel or shopping mall restroom, this simple task can get a little confusing. Do I lift it up or push it down? Do I have to press something, or is it automatic? We start getting embarrassed and then blame ourselves for such futility. Another comment I often hear from older people every time they encounter new gadgets is the I’m-too-old-for-that refrain. But come to think of it, is there really an age restriction for new technologies? How come some of our grandparents, who came from the generation that used Morse Code, can’t even comprehend how to use the single-buttoned tablet? Regardless, as what I’ve learned from the book, the basic precept of good design is that it should not confuse the user. Hence, good designs should be straightforward. The object should signify how it should be used. However, this principle does not necessarily mean that complexity is bad. Complexity is good, confusion not. This is why if you find yourself getting confused on how to use the tap in a hotel, most likely, it’s not you, just bad design. Likewise if your parents spend hours of learning to use a new gadget—it’s not them either, it could be just really bad design. It’s given that everyday things should be usable. Usability connotes being approachable. Therefore, the user should not get intimidated nor confused in his or her attempt to use a particular object. As stated earlier, the object should tell the user what to do. This is what Norman calls “affordance,” or the communication between the user and the object. And this is how human-centered design comes into play. Manufacturers and designers should always put the user on top of their minds while creating products. Since their product should cater to the needs of the user, they also need to know the users, who are human beings. Hence, this is where behavioral psychology, ergonomics and design thinking become relevant. Now Filipinos have a penchant for “maganda.”But while shopping for a product, be that canvassing for a new car or building a house, remind yourself not to fall for the pretty one easily. Don’t forget to research first and check if it’s user-friendly. If it is, then good chances are it’s also well-designed. Remember: Design over aesthetics, just like how they say “comfort over style” in fashion. Since the book teaches us the principles of design, it also encourages us to be critical and reflective of the things around us. It tells us to look into the everyday things we usually take for granted. Because apart from the small and portable objects, design thinking can also be applied to different matters ranging from organizational and program design right down to the space where we exist and live. True, many of the things we do everyday are subconscious. For instance, opening a door, turning on the stove and even checking Messenger do not require maximum mental faculty. We do these things almost instantaneously. So it is the same with the space around us, with which we ascribe meaning to. For example, we should keep the kitchen clean because it is where we prepare food; we don’t eat inside the bathroom because it’s where we do our thing; and we Filipino usually don’t bring our footwear inside the house because that means bringing something dirty inside a clean space. That is called meaning-making, or making sense of the world in which we live. The Design of Everyday Things lets us rethink how we perceive objects and spaces around us. Furthermore, it also makes us realize how objects and spaces influence how we think and, more interestingly, dictate what we do. 5. Why bear with bad design? We’ve been talking mostly about personal objects and spaces but like what I said earlier, bad designs also permeate outside our backyards. What do we see on our way to school or work? Roads that are thicker and higher than the sidewalk? Check. Pedestrian lanes that are seldom used? Check. Sidewalks where you can’t even walk through? Check. Jeepneys that can trigger claustrophobia? Cheeeck! Why does the government spend millions annually to “band aid” our roads with asphalt overlay? Why not design roads with proper drainage to prolong their lifespan? Why don’t people use the pedestrian lanes? Why can’t we use the sidewalk properly? Can we put all the blame on the ambulant vendors for taking all the space? How about the jeepneys? Do they have to go away, or at least, innovate with ergonomics in mind? Katamaran o kawalan ng disiplina ba, or just bad design? The Design Of Everyday Things made me realize the magnitude of how our society is poorly-designed and badly-made. With the kind of city landscapes and government bureaucracy we have, we should stop invoking our “okay na ‘yan” and “ganyan na talaga ‘yan” excuses anymore. Being “matiisin” is good at times, but don’t we deserve better?